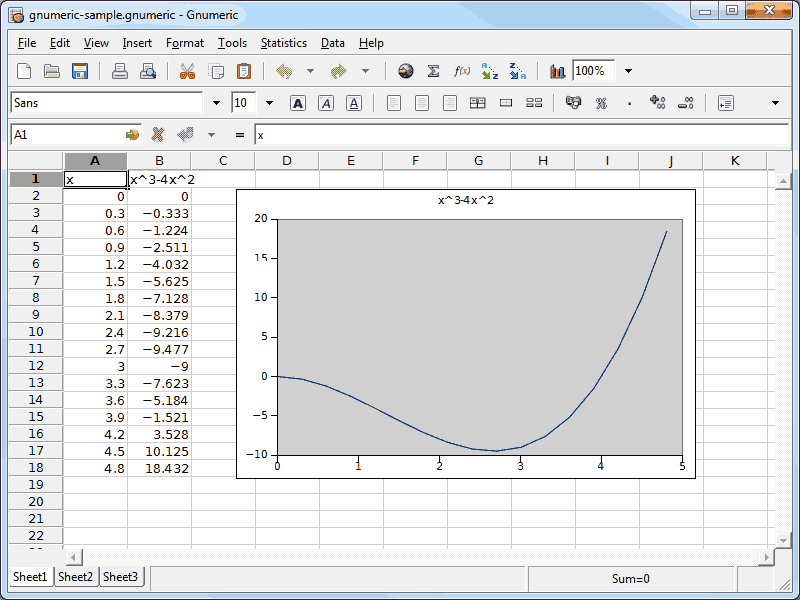 GNumeric v1.10.14 R20110324 is out. Version 1.10.10 is available from the gnome site and there are clear improvements over 1.9.3 so it is worth the effort to upgrade. It is a stable version, according to the site and after downloading the Windows version and liberal use of UPX to compress the exe and dll files, you end up a reasonable sized application. I replaced the Gnumeric files in a UPX compressed 1.9.3 portable installation with the UPX compressed 1.10.10 files and so far, (XP and Vista) all seems well. Latest version (1.10.2-20100417) has a Windows version. If you try to hide a rows, say alterating rows and you select and delete the unhide rows (say delete an alternating data in a row)and when you go back to unhide rows your data that is supposedly protected 'coz it's hidden is also been deleted. Please fixed this. it has potentials. Please add the local files again. 9 MB differences means nothing for download, but it is difficult to finde local files if they are missing in the portable version. Fairly buggy. Has enormous potential but someone's going to have to do some real work to get it up to speed. Do anyone know the correct URL of this program? Died everytime I tried to save a xls file to the USB, though maybe it was the password so I saved without still died. No idea why. Deleted program form USB. Same issue as Thor and Dubravka when attempted to run in Windows 98. May not be an issue with Windows 2000, though. I tried moving a copy of comdlg32.dll to the program folder without any change. Looks as though I will have to install Open Office on my memory stick instead. The "About" dialog under the "Help" menu freezes the application, requiring a force quit (at least on my system). 'Print Preview' not working or not included. Overall it is a nice App. I have the same problem as "Dubravka", so I would apprechiate if someone could send me a clue to solve this problem. Please keep in mind downloading of the file is slow. Extraction is very very slow. You have to be very patinet. It might take 10-15 minutes.